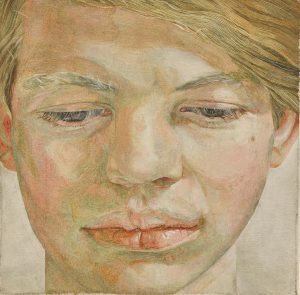 Lucian Freud’s 1956 portrait of Garech Browne – Head of a Boy – will make its auction debut at Sotheby’s Contemporary Art evening sale in London on March 5. The portrait bespeaks the lifelong friendship between Lucian Freud and Garech Browne – dedicated patron of Irish music, poetry and culture, Guinness heir, and last custodian to the magical Luggala estate. Freud first visited Luggala in the 1940’s with his wife Kitty, before eloping with Garech’s cousin, Lady Caroline Hamilton-Temple-Blackwood, in 1952. This painting of a young Garech was created at the Luggala estate during a potentially fractious moment in the course of Freud’s tempestuous second marriage; he and Caroline acrimoniously separated in 1957, barely a year after its execution. Embodying the sensational powers of observation which famously characterise Freud’s work, this is a remarkable example of portraiture executed when Freud was just 34 years of age. Small in scale and yet boasting a remarkable emotional intensity, the 18 by 18cm work is at once testament to the artist’s masterful control over his subject, and a tremendous tribute to the sitter – the late Hon. Garech Browne. The portrait hung adjacent to the fireplace in the grand sitting room at Luggala for over half a century. It is estimated at £4.5-6.5 million. Garech, who founded Claddagh Records in 1959, became custodian of Luggala in 1970 and continued the legacy of legendary Guinness hospitality. He relished live performances by musicians. The Luggala visitors’ book highlights the diversity of musicians who spent time at the house from 1970: singer Dolores Keane, composer Frederick May, singer Marianne Faithfull, Sting, Bono, The Rolling Stones, Mick and Bianca Jagger, and Michael Jackson. This entry was posted on Thursday, January 31st, 2019 at 5:21 pm	and is filed under ART, AUCTIONS. You can follow any responses to this entry through the RSS 2.0 feed. You can leave a response, or trackback from your own site.